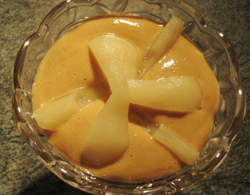 One of my favourite desserts is zabaglione, a rich Italian custard, made with Marsala wine. It’s complex, not too sweet, and packs a nice alcohol punch. I’ve had a bad cold the past few days, but today I felt recovered enough to pull out the pans and treat myself. 1. Beat together the egg yolks and sugar until they turn pale yellow. 2. Add the Marsala wine, beating all the time. 4. Transfer to a double boiler (I used a metal bowl over a pan of water). 5. 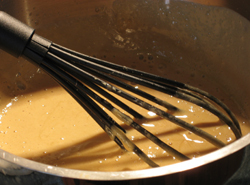 Continue whisking the mixture until the volume doubles and coats the back of a spoon. 6. Remove from the heat and allow to cool. 7. 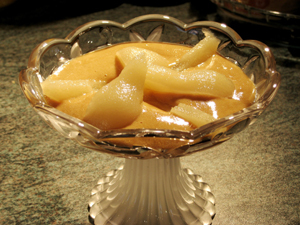 To serve, distribute the custard among 4 bowls and top with the poached pears. Note: This dessert works well with many different fruits – strawberries, peaches, etc. Have fun and experiment. I’ve just taken the plunge and re-ordered from our Marsala supplier, Frazzitta, in time for Christmas. I’m confident their wines are the best Marsala available in Ireland. It would be extremely cool and groovy and help sales if everyone had a go at this delicious recipe. I’m taking a new bottle home to try it out because after the crÃ¨me brulÃ©es at the weekend, I do happen to have five egg whites lying around.